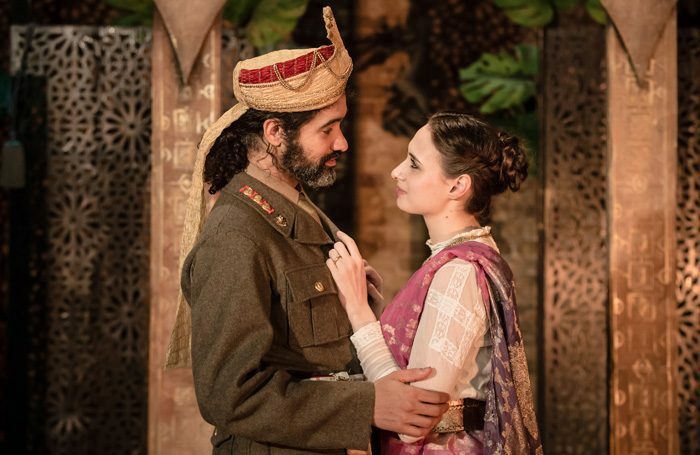 Phil Willmott’s elegant production relocates Shakespeare’s play to the Edwardian British Raj and makes Othello a conflicted collaborator in the British army. It’s beautifully designed. Justin Williams and Jonny Rust’s set, featuring the gold leaf-painted skeleton of an Indian palace, is exemplary. The scent of incense permeates the auditorium, creating the impression of a British army enjoying Indian exoticism while in denial about the more brutal reality of colonialism. Zoe Burnham’s golden lighting bathes the set, while torchlight is grippingly employed in the climactic scenes. Julian Starr’s delicate sound design heightens the production’s sensuousness even further. Matthew Wade is arresting as the gentlemanlike but authoritative general who is also capable of real cruelty. Carlotta De Gregori is a graceful Desdemona, with a rebellious streak that indicates that she might have initiated the relationship with Othello, but she’s also innocent enough to unwittingly suggest that her interactions with Cassio (who, puzzlingly, has been transformed into a chaplain) might be more than merely cordial. Rikki Lawton’s spivvy Iago, here a member of the servant class without opportunities for promotion due to his birth and education, is particularly insidious in his falsely well-meaning attempts at being reassuring. As a reminder of the cruelty and arrogance of British colonial rule, Willmott’s production poignantly exposes the ugliness behind a colourful backdrop in the centenary year of the 1919 Jallianwala Bagh Massacre, a tragedy on a mass scale that led to the Indian independence movement.